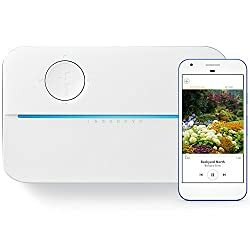 I’ve been using the Rachio V3 smart sprinkler controller in the third generation and I’m really impressed with it. So here is my review. The controller definitely lives up to the hype. It’s the number one best-selling automatic irrigation controller on Amazon for a reason. It is definitely the most polished, and the most full-featured controller on the market right now. It waters up to 16 zones. It connects via Wi-Fi and supports dual-band, both 2.4 GHz, and 5 GHz. The setup for this is super simple and with a smartphone app, it gives you tons of information data charts and graphs. It even has an open API and it integrates with IFTTT and is EPA WaterSense certified. Basically, that means you can get a big rebate if you jump through the water companies hoops. It’s even made in the US, so the hardware on the Rachio is really nice. The outside cover is a little flimsy and kind of feels like some cheap plastic. However, the controller itself is nice when I mounted it up to the wall and it felt very sturdy. That thing isn’t going anywhere. Compared to a couple of other sprinkler controllers I’ve used. Where they’ve kind of flopped around and didn’t really sit tight to the walls. When the Rachio is on it has this cool blue LED that’s kind of always-on lighting up your garage and it’s kind of a cool little touch. Getting the Rachio wired up with the sprinkler wires was not that hard. Pretty much every sprinkler controller super simple to get wired up. The Rachio 3 has easy press connectors which make life so much easier than it was with previous versions and supports both 14 and 22 gauge wires. But I’m not sure if that was just because I had these stickers on the wires the last time around that were identifying the zones. I had to do it a couple times because I accidentally routed the wires on the outside of the unit. Then I realized whoops! I did this wrong and had to redo it. Then once you get it all wired up and plugged in and turned on the setup is quite easy. You download the app to your smartphone. The Rachio V3 requires you to use a smartphone it senses it on the Wi-Fi network and it was pretty automatic. You don’t have to put in your Wi-Fi password to get it onto your home Wi-Fi. It talks through your phone and gets that information. That was kind of a first for me. You input the serial number of the Rachio then it can talk to the Rachio servers. Once you set up your own account and get all that rolling it goes through pretty quickly and smoothly. It’s an easy on-boarding experience. What can it really do? After that, It starts detecting your zones. So for example, if it tries to activate Zone one and then you hear your sprinklers going, don’t be surprised. The really cool part about the ratio setup is that it goes through this step-by-step process. This is where it asks you the details of your zones so the first thing it asks is what’s growing in the zone? Then it asks what type of soil is in the zone? Then it asks how much Sun hits the zone? What type of sprinklers are you using on the zone? What kind of slope is on the zone? All of this information goes into the Rachio database and it helps the Rachio decide how much it’s going to water that zone. So far I’ve found this to be an awesome formula. It seems like the ratio algorithm is spot-on. I use a plant linked soil sensor in my yard in one of my zones. I’ve been keeping track of the plant link and how it is saying how much water is in the zone versus the ratio and it’s estimation of how much water is in the soil and they’re pretty much spot-on. The plant link which is a physical item that you stick in the ground is saying “Hey you should water next Sunday” and then the Rachio’s algorithm is basically saying the same thing. This is going to be a great thing for my plants this coming summer and it just means that I don’t have to worry about this stuff anymore. This is why I got into smart home items, to begin with. I don’t want to worry about it. I don’t want it to be watering when it’s raining out. But even more so I want it to water when it needs it, not water when it doesn’t. I want to really get my grass growing good and really get my plants growing the best they ever have. Instead of me trying to guess how many minutes a day for each zone. Another cool feature in the Rachio is that you select your weather station and the weather station that it had for me is actually far enough away that it’s a kind of a different micro-climate. It gets a lot colder at night. So I decided to use a different weather station that is basically on this other list called the “personal weather station list”. I found one that’s only a like a mile away from my house and I was able to check that weather station out and see that it’s recording precipitation data and that it probably will be a good fit for my house. I just thought that was so cool that there are random people out there that set up these weather stations plug them into the internet and share this data for all of us to use. So once the ratio starts watering it you can start looking at your data and all your usage stats and I love that. It’s awesome that it has all these charts and graphs and it’s almost information overload! I think if you’re buying a smart sprinkler controller you’re already kind of a geek so this is just right up your alley. It’s going to show you that you’ve used this many thousands of gallons of water and it watered less this day because of this and that. I just love it. I love all the details, I love the charts, I love it all! Even the soil moisture thing is not a big secret. You can dig into each zone and look at the details and see each piece that it’s using to calculate what the soil moisture is. You can even see a graph of the soil moisture in that zone. The app offers you everything you think you should have in an app to be able to manually water zones. Start sprinklers, stop sprinklers, change the schedule anything you can think of. You can do all this inside the app. The one place that really shines for me with the Rachio is the geekiness, it has the open API. It has all this data that you could take into your own apps or build your own things around or create your own dashboard with. Which I just think is awesome! I might not end up doing any of it, but just the fact that it has the ability. That it’s built in, that it’s there for developers and anyone to take a hold of is awesome. Then if you’re really not a programmer or developer type person you can go into IFTTT and connect your Rachio. Turn it on, connect it and then you can start to connect it to other smart devices so you can tell it to do other things. Maybe something like if the ratio starts watering then log it to a spreadsheet or send me an email or light up the light bulbs in my bedroom to turn purple. There are these thousands of possibilities that you could set up when your ratio turns on. When your Rachio turns off or when it skips a day to notify you or interact with the world some way. Can the Rachio save you money? I touched on the EPA WaterSense certification thing a little bit before. But I think I want to harp on it a little bit more because in my County I can get a 50% rebate if I jump through the water companies hoops. They send someone out to your house and survey to look at your setup. I have to have four zones, I have to have a thousand square feet of landscape and I think I qualify for all that stuff. But you have to have them come out before you install it so they look at your old sprinkler controller and then they look at your new one. Then, of course, you have to fill out some forms and mail them in. It’s a couple of Hoops to jump through. However, for the amount of money, it saves you for something that you’re already going to do it might be worth it for you. If you want to check out the current price, you can find it over here on Amazon and have a look. The Rachio is going to save you money it’s going to save you time and it’s going to give you peace of mind. Because you’re not going to be worrying about your sprinklers anymore. Yes, it’s true! Set it and you forget it! How awesome is that?! The data is completely transparent and it’s accessible. You can dig right in. You get these great dashboards and tells you all this information. You can customize every little bit of it. Who knows maybe in six months or so they’ll release an 8/8 zone version that’s a hundred bucks cheaper. I think most normal people that’s probably more up their alley but for us geeks there that want to get into it now, it’s a great time it’s a great device I can’t recommend it highly enough. While you’re here make sure you check out some of my other articles, like the one about which smart home hubs are best or who makes the best smart thermostat.